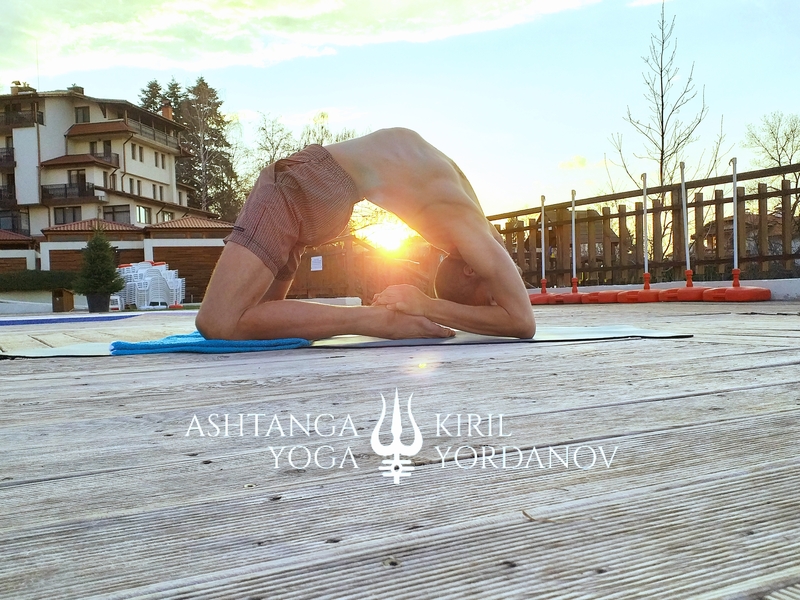 You are very welcome to practise Ashtanga Mysore style at Ashtanga Yoga Shala Frankfurt. Try to set up a regular practice, ideally six days per week. (No Mysore classes on New and Full moon.) Drop-ins are only recommended for experienced practicioners. Please leave your shoes in the lobby, your bag and clothes in the dressing room and try to take in only the belongings you need during the practice. Personal hygiene is an integral part of practicing yoga. Please ensure that you and your clothes as well as your mat are clean. Try to avoid perfumed products. Refrain from eating at least 2 hours prior to and 30 minutes after your practice. Drink plenty of water after your practice. Try to start your practice at the posted starting-time of the class, when the opening mantra is chanted together. If you come later, please enter silently and wait for the teacher to show you your spot. Start with the opening mantra but in silence. Please respect and follow the traditional Ashtanga method as taught by Sri K. Pattabhi Jois. Please do not add, skip or in other ways deviate from the traditional Ashtanga sequence of yoga asanas unless acknowledged or requested by your teacher. If you do not know the sequence, have a look at an asana sheet before class, but don´t use it during class to help you to learn to memorize the sequence. Ask your teacher, if you can´t remember. Respect the student-teacher relationship and follow any request from your teacher. Inform the teacher if you have any injuries. Do not take any new asanas unless agreed upon with your teacher. Do not ask the teacher for new poses, he/she will approach you when the time has come. Patiently wait for the teacher to come to adjust you if she/he is busy adjusting another student. Have a towel at hand, which the teacher can use when adjusting you. Stay on your own mat and refrain from assisting other practitioners. Respect your limits. Acknowledge that your body and mind will feel different every day; listen to what your body tells you and practice in your own time following your own breath. Practice with care and consideration towards yourself and others. Refrain from unnecessary talking. If you feel emotionally upset during or after a yoga session (joy, sadness, irritation,etc.) then accept the feelings and bid them welcome. If this feels difficult, you are welcome to speak to your teacher about it. Do not underestimate the effect of Ashtanga yoga. It is a very effective self-therapy for personal development – physically, mentally and spiritually. Consider a balanced practice integrating both activation and release, engagement and softening, as the means to your progress. It is always a nice gesture and part of the tradition to say goodbye to your teacher when you leave the room.